Got All Media lets you Watch, record and timeshift TV. Manage and play DVDs and movies. Play local and stream Internet music. Stream YouTube, Google and MySpace videos. Stream free Internet TV. 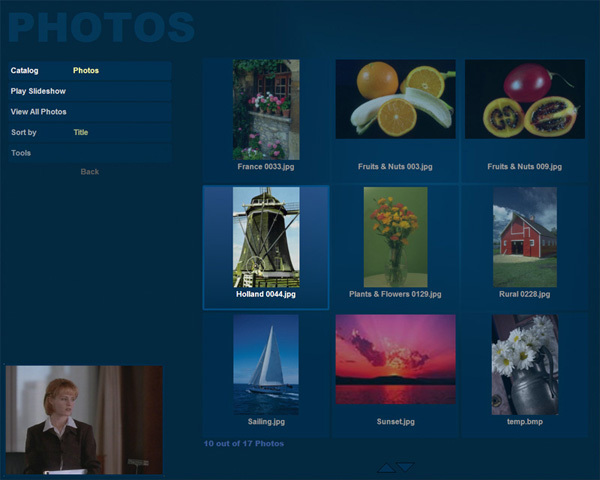 Organize and show photos. Follow the latest news with RSS feeds. All this easily managed under friendly UI. * Customizable Graphical User Interface. * Supports MCE, ATI, FireFly and similar remotes. * Simple and friendly User Interface. * Fast and responsive even with older computers. * Got All Media Built-in screensaver. * Supports any HID based remote. * Supports USB-UIRT for receiving and transmitting. * Allows TV watching, recording and timeshifting. * Automatic TV Guide download. 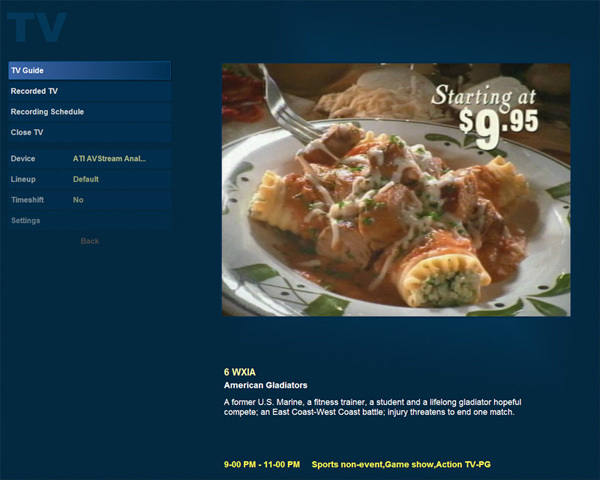 * Free TV Guide for USA/Canada or XMLTV for other areas. * Scheduled recordings for single program or whole series. * Web scheduling with internal server. * Got All Media Supports any Analog TV Card with WDM drivers. * Supports Hauppauge WinTV-PVR 150/250/350, Theater 550 Pro and other hardware MPEG2 cards. * Supports any HDTV and DVB-T card with BDA drivers: including FusionHDTV I/II/III, ATI HDTV Wonder, Avermedia A180, Nova DVB-T and more. * Supports PX-M402U with hardware Divx encoding or MPEG2 recording and timeshifting. * Supports Motorola DCT-6412 and similar firewire/USB set-top boxes. * Hardware Deinterlacing with VMR9 and VMR7. * VMR9 Exclusive mode for best TV quality available. * Guide search using keywords, genre, actors directors. * TV recordings scheduling of single program or series. * Internal support for playback of MPEG, WMV, AVI and other file types. * Internal support for playback of HDTV/DVB transport files. * Auto or manual screen capture for TV recordings. * Multi-tuner support for viewing and recording with any combination. * Recording codec selection Windows Media/DiVX/XVid, MPEG2 and other types. * Digital timeshifting combined with analog non-time shifting channels. * Channel profiles per input,type and other. * Support for MPEG2 filters selection for video and audio, TV viewing and files playback. * Direct support for USB-UIRT. * Direct support for RedRat2 or ACTiSYS IR-200L IR Blaster using OpenSource IRTuner.dll or the drivers themself. * Direct support for DCT2000 series serial control. * Support for Hauppauge IR Blaster. * Channels Tuning - Custom and fine tunning. * Recordings: MPEG2 for MPEG2 hardware cards. Transport stream with HDTV cards. WMV, Custom (Divx, Xvid or others) or MPEG2 (Needs Intervideo codecs) for other cards. * ffdShow for TV and File Playback with presets. * Events using Girder, other Application or DLL. * Tuner switching per channel. * Play DVDs and other videos types. * Play single or list of movies. * Skip DVD trailers and ads and play the movie directly. * Auto save movie position to restore for later playback. * Movie information and cover art auto-download. * Playback of AVI, Divx, Xvid, MPEG2, WMV and other video types including Digital transport (TS/TP) files. * Custom Divx,Xvid,MPEG2 and other codecs selection. * Got All Media has Movie Info and Images download. * Fast aspect ratio selection. * ffdShow support with presets. * DVD Profiler information support. * Fast filtering by Genre, Actors, Date and more. * Fast search by Title. * Online (Hard Disk) DVD playback. * Offline (DVD Drive) DVD disk management and identification. * Support for ISO DVD images using DAEMON tools. * DVD Bookmarks, position save and restore, locally or globally. * Play music from your computer. * Play CD from CD drive. * Rip CD to your hard drive. 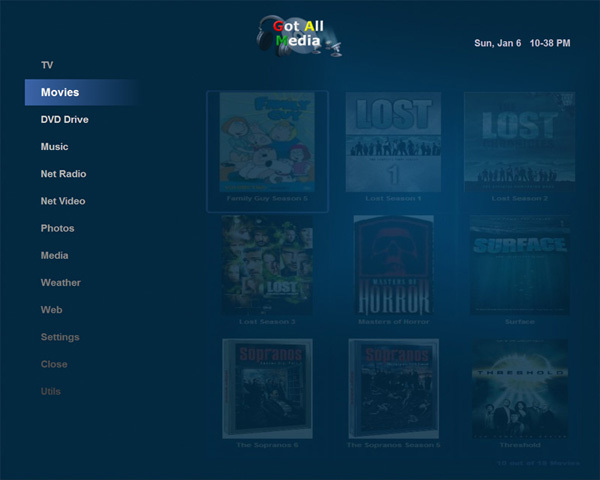 * Manage music with catalogs. * Play single or list of tracks. * Music information and cover art auto-download. * Music Player selection: Internal, Windows Media, Winamp or Foobar2000. * CD Player with auto Info and Cover Art download. * CD Copy (ripping) using WMA or MP3 encoding. * Fast queuing and/or playback. * Fast search by Artist or Album Title. * Search and Play YouTube, Google and MySpace. * Browse and Stream free TV stations from around the world. * Stream fullscreen or windowed like any other video in the system. * Got All Media Downloads the video to your computer. * Browse by popularity, viewing and user rating. * Search YouTube or MySpace by user. * Auto-login to YouTube when needed. * Browse photos from your computer. * Fast rotation and navigation. * Got All Media Photo albums management. 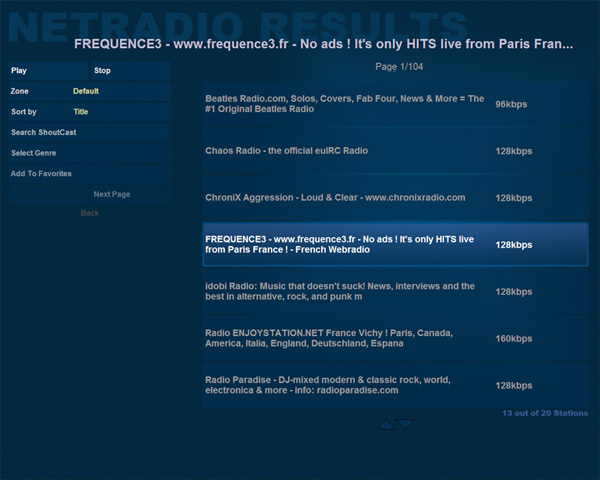 * Search and Stream Internet Radio. * External plugins for weather, news and more. * General mudules for custom actions. * Got All Media Web browsing with RSS support. * X10 control from all modules.